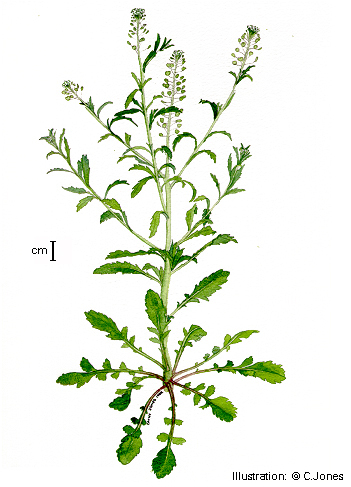 KEY FEATURES: A herb to about 15cm, with a basal rosette of leaves with others along the stalk and branches, and a long flower stalk. The basal rosette leaves are divided pinnately into small toothed leaflets with a large terminal toothed leaflet. The upper leaves are simple and toothed. The flowers are tiny, terminal and white. The solitary fruits are flat discs ±3mmØ on thin 4mm stalks. 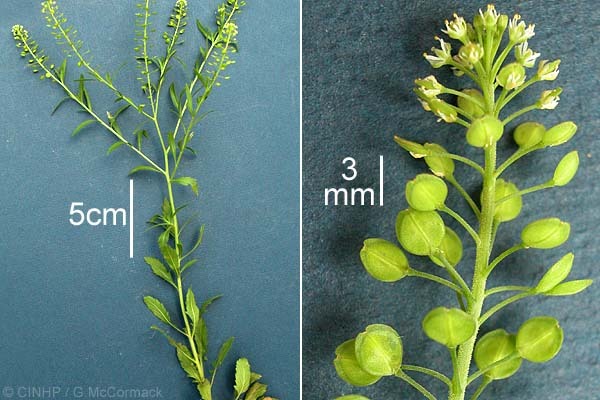 SIMILAR SPECIES: Native Peppergrass (Lepidium bidentatum) is distinguished by its larger oval fruit (4x6.5mm) and its simple leaves with up to 2 teeth per side.